Laparoscopic adjustable gastric banding (LAGB) is associated with high long-term failure rates, often requiring conversion to an alternative bariatric procedure. The most efficacious procedure after failed LAGB is subject to debate. Our objective was to compare 12-month weight loss following laparoscopic sleeve gastrectomy (LSG) vs. laparoscopic Roux-en-Y gastric bypass (LRYGB) performed for insufficient weight loss or weight regain after LAGB. 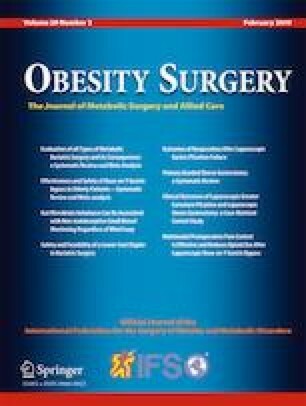 A systematic search was conducted in PubMed and Medline for English language studies comparing weight loss after a conversion surgery for failed gastric banding. We examined studies with patients who had at least 1-year follow-up and included conversions to both LSG and LRYGB. A fixed effects model was created, and variance measures were calculated to measure heterogeneity. Both were analyzed for significance. All statistical analyses were conducted with the “meta” package in R 3.3.2. The initial search produced 17 studies. Six studies, consisting of 205 LSG and 232 LRYGB patients, met our inclusion criteria and were included in the review. Heterogeneity among studies was high (Q = 23.1; p < 0.001). There was no statistically significant difference in weight loss after 12 months between the groups (p = 0.14). It remains unknown which conversion procedure is more appropriate to perform after a failed gastric band in order to achieve the highest weight loss potential. In our meta-analysis, there was no difference in weight loss after 12 months in patients who were converted to LSG or LRYGB. Further studies and longer follow-up comparisons are required before firm conclusions can be drawn. Informed consent was not a necessary component of this study.